The new Moto Guzzi V7 Classic could be the perfect bike if you are looking for a classic but don’t want to get your hands dirty. The opening scene of the iconic movie the Italian Job has a song called 'on days like these' playing over it, and if you could play that song in the background while you read this launch report, that would be perfect. This was the tune I couldn't shake out of my head as I rode the new Moto Guzzi V7 Classic around the stunning roads that skirt around Lake Como, northern Italy. The V7 moniker will certainly be familiar to Guzzi fans, but for those of you that haven't been paying attention at the back (of the 1960s) the V7 name was first seen on a bike in 1968. 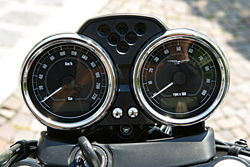 It meant literally V for the V-twin engine configuration and 7 for the 700cc capacity that the first bike contained. 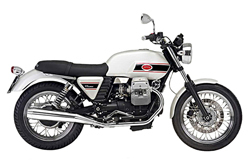 The new bike obviously harks back to an era that saw Moto Guzzi at the top of its game, one where it employed thousands of people at its Mandello factory rather than the 220 that work there now. Ah, the march of time. For such a small crew they certainly make the most of the parts lying around the factory floor, as this is essentially a 'bitsa'. The front wheel, tank, rear sub frame and exhausts are all specific to the V7, but everything else has been lifted from the 750 Breva, bar the clocks which you will find on a Ducati Monster, though these ones have fancy Moto Guzzi faces and chrome (plastic chrome that is) bezels. Don't let that put you off though as the V7 is one of the prettiest bikes I have seen in a long time. Since the launch of the Ducati GT1000, in fact. Not that this bike should be compared to the retro line-up from Ducati, as it only makes 48bhp. Think Triumph Bonneville and you would be closer in terms of a comparison. The riding position is comfortable if not a little downsized from a modern style bike. If I was riding this bike everyday I would want to roll the bars forward in the clamps a little to give a bit more room, and this would also give the mirrors a fighting chance of showing me something worth looking at. The seat managed a reasonable 80 miles before I had to stand up and have a bit of a stretch, so if you are planning on using one everyday you can bank on feeling comfortable as well as looking good, so long as you don't have to crack a huge commute. 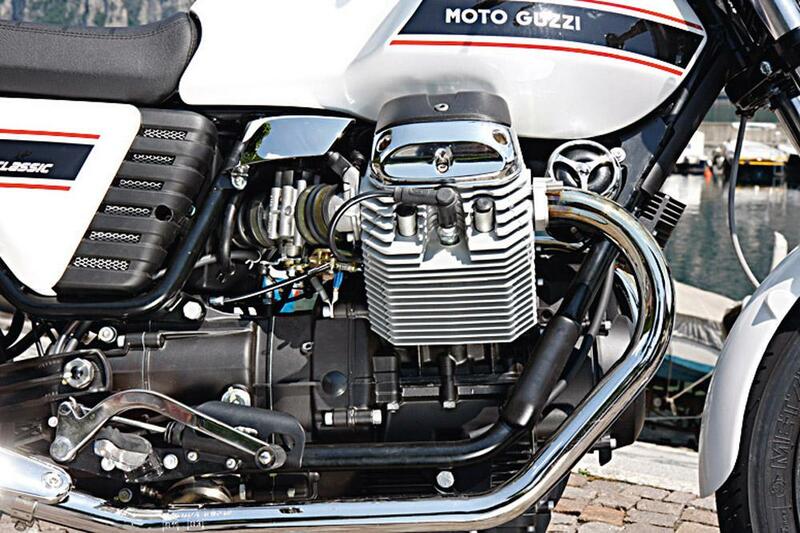 The riding dynamic of any retro styled bike is an important factor, and clearly Moto Guzzi have taken this into consideration as the V7 delivers everything that you would expect from a brand new machine. Even though it looks as old as your Dad. The rear brake and gear levers are the 'up and over' style but they work flawlessly, clutch-less shifting was easy and felt natural to do. I didn't need to find excuses to snick up and down the five speed box as we were in switchback heaven on the test route, no false neutrals or sticking gears were experienced, just a super smooth transition from one gear to the next. The brakes were just as impressive, Brembo front and rear never let me down, even when pushed further than most owners would probably want to. Braided lines looked a little out of place but once we got stuck in they made perfect sense. The 744cc 90° two-valve twin suits the bike perfectly. It's a perky little number that, if you look at the brochure figure of 48bhp seems underpowered, especially when you consider that the bike weighs 181Kg dry. That's not the full story though as it fuels really well, revs eagerly and, along with the ample brakes and competent suspension allows you to buzz along happily regardless of what kind of road your on. I never found that I was running out power in any gear, maybe this showed that the bike had been developed on the roads we were riding but you could could hustle the bike along a fast A-road back in the UK no worries. In keeping with the retro look the Guzzi's front wheel is an inch bigger than the rear at 18”. This caused some confusion when I started riding. It felt like it didn't want to turn, like the head bearings were being strangled. After some studious experimentation I found it was much easier to steer from the back of the bike, laying it over and letting the front follow the rear. Think of steering a boat with a tiller and you will get what I mean. Lazy, easy steering in tune with the bike. The fact that the brakes, suspension, controls and power delivery are so good shouldn't surprise but it will, such is the effect the styling has on your senses. It really does look like a mint condition classic so you throw a leg expecting to have to tickle the thing into life and then wrestle it round the roads. When you have thumbed the starter it rocks on the side stand and burbles away through exhausts that you would never want to replace with aftermarket items. It's back to basics biking in the mechanical sense, which makes it perfect for beginners or commuters. But the V7 is so much more than that. It will make you smile every time you take the cover off to go for a ride. The brakes slow you down, the engine speeds you up, simple. The most important factor on this bike is the way it makes you feel, and if it has the same effect on you as it did on me then you won't want to know what kind of spark plugs it has. You read about Fireblades being launched on tracks and Teneres being in the desert because they are the best environment to show off the bike's qualities. Whether the V7 will be any good on your favourite A-road is up to you but in the environment I rode it I couldn't think of any other bike I would rather be on. The opening scene of the iconic movie the Italian Job has a song called ‘on days like these’ playing over it, and if you could play that song in the background while you read this launch report, that would be perfect. This was the tune I couldn’t shake out of my head as I rode the new Moto Guzzi V7 Classic around the stunning roads that skirt around Lake Como, northern Italy. The V7 moniker will certainly be familiar to Guzzi fans, but for those of you that haven’t been paying attention at the back (of the 1960s) the V7 name was first seen on a bike in 1968. It meant literally V for the V-twin engine configuration and 7 for the 700cc capacity that the first bike contained. 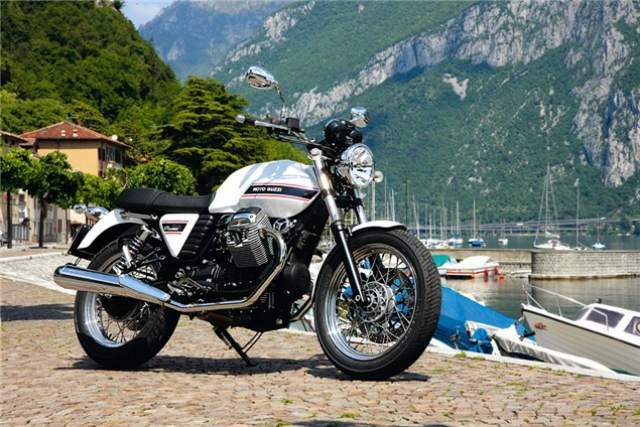 The new bike obviously harks back to an era that saw Moto Guzzi at the top of its game, one where it employed thousands of people at its Mandello factory rather than the 220 that work there now. Ah, the march of time. For such a small crew they certainly make the most of the parts lying around the factory floor, as this is essentially a ‘bitsa’. The front wheel, tank, rear sub frame and exhausts are all specific to the V7, but everything else has been lifted from the 750 Breva, bar the clocks which you will find on a Ducati Monster, though these ones have fancy Moto Guzzi faces and chrome (plastic chrome that is) bezels. Don’t let that put you off though as the V7 is one of the prettiest bikes I have seen in a long time. Since the launch of the Ducati GT1000, in fact. Not that this bike should be compared to the retro line-up from Ducati, as it only makes 48bhp. Think Triumph Bonneville and you would be closer in terms of a comparison. The riding position is comfortable if not a little downsized from a modern style bike. If I was riding this bike everyday I would want to roll the bars forward in the clamps a little to give a bit more room, and this would also give the mirrors a fighting chance of showing me something worth looking at. The seat managed a reasonable 80 miles before I had to stand up and have a bit of a stretch, so if you are planning on using one everyday you can bank on feeling comfortable as well as looking good, so long as you don’t have to crack a huge commute. 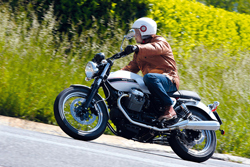 The riding dynamic of any retro styled bike is an important factor, and clearly Moto Guzzi have taken this into consideration as the V7 delivers everything that you would expect from a brand new machine. Even though it looks as old as your Dad. The rear brake and gear levers are the ‘up and over’ style but they work flawlessly, clutch-less shifting was easy and felt natural to do. I didn’t need to find excuses to snick up and down the five speed box as we were in switchback heaven on the test route, no false neutrals or sticking gears were experienced, just a super smooth transition from one gear to the next. The brakes were just as impressive, Brembo front and rear never let me down, even when pushed further than most owners would probably want to. Braided lines looked a little out of place but once we got stuck in they made perfect sense. 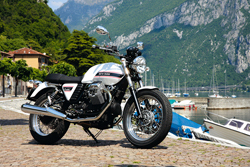 Click here for Moto Guzzi V7 Classic review page 2 of 2.